Other than the basic idea of an Arcimoboldo type of character, I did not reference the artist's paintings in fabricating the Fruitman figure. Instead I relied on a concept drawing, by Don Waller, which had a contemporary design. 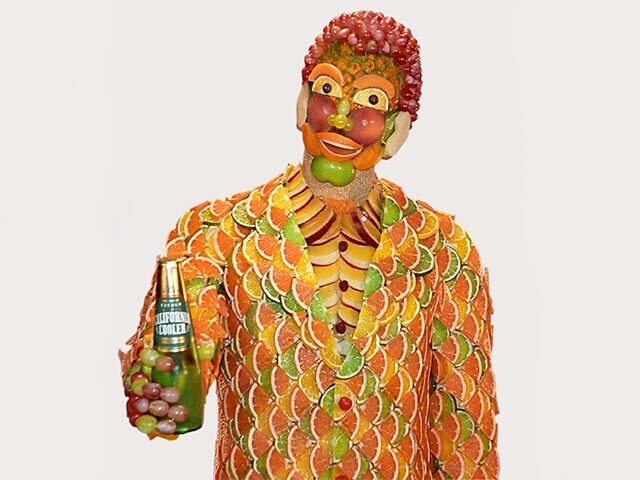 Building the Fruitman out of artificial fruit was my only option in order to create a realistic appearance, but doing so forced me to make the scale life-size. I knew up front that this puppet would be very tough to animate due to its sheer size, and therefore it required an armature of robust steel. Since I could not locate an expert armature maker on short notice, I had to make do with my limited machining skills. I pieced together a rudimentary steel skeleton, mostly with hinge joints, and a few ball joints at the shoulders, neck, and wrists. The torso and arms were built up with sheets of foam rubber. To support the exterior fruit suit, I located a white jacket from a thrift store. It was a fun task attaching all the artificial fruit to the puppet's body using hot glue. The hands were made of fake grapes over an aluminum armature wire, but the head was the biggest challenge. It had to have a likable countenance and be fully expressive for the animation process. 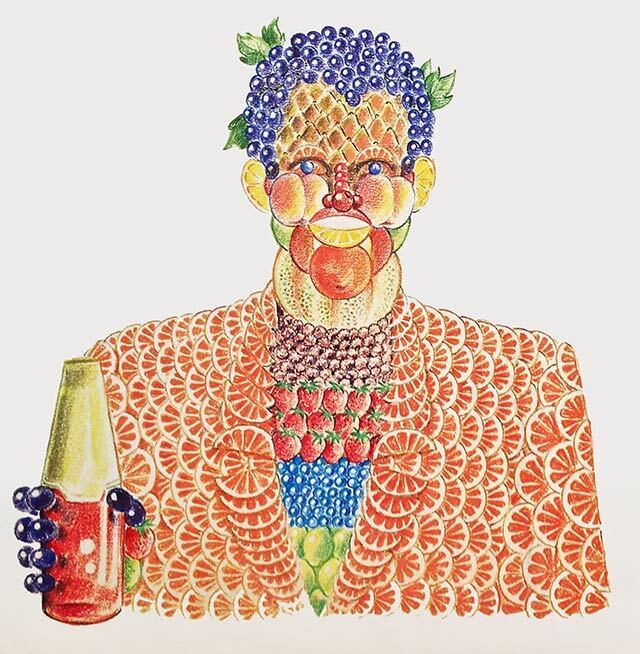 The main gag of the commercial was that a man would transform into the Fruitman when he picked up a bottle of Fruit Cooler. Director Stephen Johnson had previously filmed an actor to perform the action. 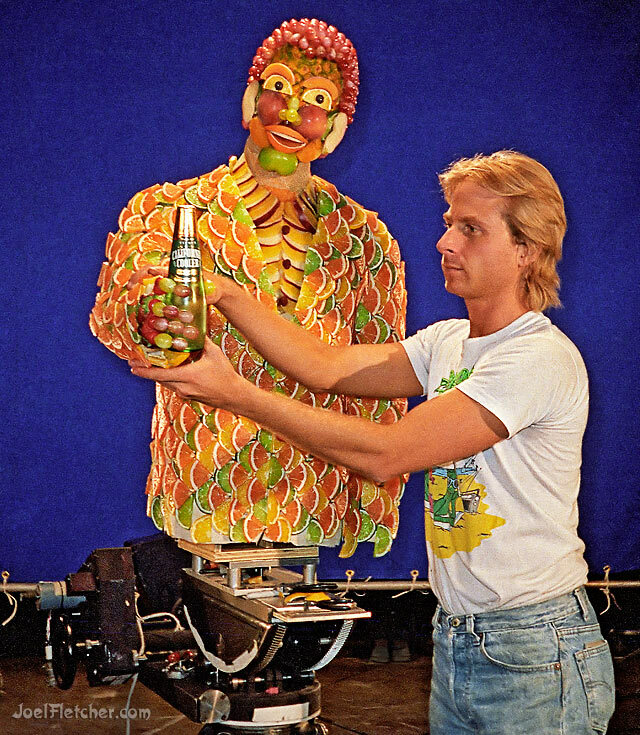 My responsibility was to match the Fruitman to the actor's movements during the initial transformation. The best solution we could come up with, using 80's technology, was to have a custom video laser disc made of the pre-filmed actor. The stage crew set up the laser disc equipment which allowed me to view the actor frame-by-frame, and that helped me to line up the Fruitman's animation. Fortunately, the painstaking match-move only took place at the beginning of the commercial. I was free to animate the performance in any way that I chose after the initial match. The puppet's main body moves were accomplished by a geared pan and tilt head, attached to Fruitman at the waist. As expected, the sheer size and weight of the puppet, and his creaky armature, made the animation extremely difficult. It may not have been the smoothest animation, but Stephen and the client loved it. 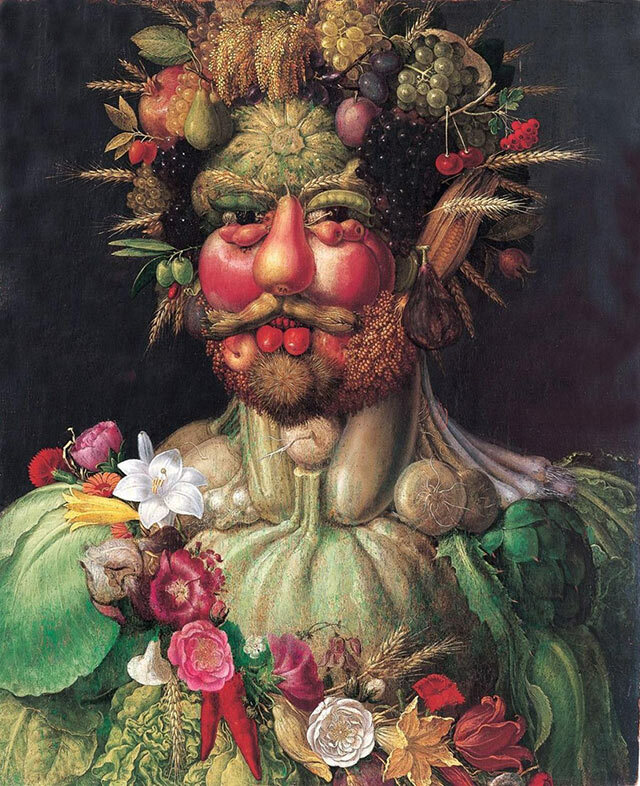 What would Arcimboldo think of this moving, modern, and commercialized manifestation of his concepts? California Cooler commercial ©1988 Brown-Forman Inc.